Sportbikes.net > Vendors > Annitori Distributing > HM Quickshifters IN STOCK now! Annitori Distributing is proud to announce that we are now the North American distributors for the HM Quickshifter line of products! ...and NO, this is NOT just another quickshifter...!!! HM's is something completely new and different, well beyond the comparatively old designs which everyone has been limited to purchasing up until now. What do Ten Kate Honda, Xerox Ducati and a long list of British Superbike, Supersport and TT riders all know and use? Because HM has solved the problem of converting the $2000+ technology of MotoGP racing strain gauge shifters into the smoothest, safest, simplest and most technologically advanced product that all of us can finally afford to buy. What is the difference between other quickshifters and HM Quickshifters? Virtually all other Quickshifters in the market base their action on a mechanical switch, sometimes called "transducers" or "pressure sensors". But in the end, a mechanical switch. By comparison to the HM design, these "switch designs" are primative devices that have served mankind well for many years, but are now relics of the past. What is wrong with a mechanical switch? "Nothing", in a enviromentally controlled clean room, but "everything" in the real world; not to mention down in the bowels of a motorcycle quickshifter system. A) Mechanical switches (transducers, pressure sensors) are VERY suceptible to vibration and shock. A common part of racing world, shock and vibration are encountered almost constantly everywhere else one might be. Add in a bit of "Mother Nature's" environmental elements like rain, dust, dirt, all mixed with road grime and you can understand why so many mechanical switch quickshifter systems fail so quickly. HM use NO mechanical switches, everything is digitally controlled; the HM is virtually indestructible because THERE ARE NO MOVING PARTS TO BREAK or go bad! B) Virtually all mechanical switch (transducers, pressure sensors) versions are "distance" based, meaning the gear lever has to be moved a certain distance for the quickshift to be initiated. Variations and wear over time of a "switch", combined with the variations of "your" gearbox, "your" linkage, "your" rearsets, "your" connection fittings, etc., means you might actually be "engaging" the gearbox before the quickshift is initiated, one of the primary causes of clunky shifts, missed shifts or worse, massive gearbox wear. HM Quickshifters are fully adjustable for gear lever pressure because the HM Quickshifter works by measuring the molecular change in the shift rod when a force is applied to it. The quickshift is initiated according to YOUR gearbox, YOUR linkage, YOUR rearsets, etc, (you get the point), of YOUR bike. It is why every rider who tries the HM, especially after swapping off competitors designs, comments on how incredibly quick and smooth the shifts become. Smoother shifts, quicker shifts, and less wear on the gearbox are all what make the HM better then anything else out there. C) Virtually all mechanical switch (transducers, pressure sensors) versions rely on a spring or other pre-tension mechanisms to hold the switch open. The quality and strength of the "spring" determine the amount of force required to initiate the quickshift, and as with any "spring", these wear and no longer respond as designed, causing rough shifts or damage to your gearbox. HM Quickshifters have no springs, no moving parts, and are 100% digitally controlled. You set the HM to initiate when YOU want, precisely for your bike, 100% of the time. Why doesn't everyone use the HM type of strain guage for their shifters? Strain guage systems are VERY expensive items, usually costing thousands of dollars and require complex electronics to interface with the bike. Not to mention an external amplifier necessary for the strain gauge to function correctly. Load cells also need to be constantly adjusted for zero drift, temperature drift and creep (all of which are technical discussions that you can find discussed online by downloading our .pdf of "Strain gauges vs. Load Cells from our website), factors that can vary radically if not adjusted for. HM uses their own powerful DSP (Digital Signal Processor) as well as their own complex algorithms and software to automatically compensate for zero drift, temperature drift and creep. HM calculates and adjusts over 100 times per second, ensuring glitch free operation across any riding situation. 1) HM Quickshifters are Strain Guage activated, nothing else outside of MotoGP uses this technology. Nothing is better; and nobody outside MotoGP offers this. 3) HM Quickshifters are the kindest and gentlest way to treat your gearbox. HM uses the ignition side of the motorcycle to unload, which is far kinder then most other designs that come from the fuel side. 4) HM Plus Quickshifters are STAND ALONE systems, integrated to the ignition side of the motorcycle as a quickshifter should be. No need for complex interfaces with other fuel side ECU's, no software glitches, no need for constant adjustments or any chance of interference to any other operational aspect of the motorcycle. 5) HM Plus Quickshifters kill from the ignition side of the engine, so there is no chance of "extended" fuel burning, secondary injectors (which most modern sportbikes have) that are not shut off, or any other problems that might be associated with fuel side controls. Spark is dead, gearbox unloads and the HM initiates an ultra smooth, gentle and unquestionably fastest gear change you can get. 6) Every function (Compression / Extension, Sensitivity and Kill Time) of the HM Plus is controlled from the HM LCD screen, and you never have to deal with "interface problems" again. This alone is worth TONS given what we have read and seen with some competitors products! 7) Every HM Quickshifter works in EITHER the "up" or "down" shift pattern, and you can change this anytime you wish from the LCD screen. No need to buy "one or the other" for your shift pattern, and you never have the wrong setup. The HM can be set for either, and easily adjusts back and forth anytime you wish. 8) Every HM Plus is fully adjustable for lever sensitivity, so you can adjust for the specifics of your machine, gearbox and riding style. Nothing is kinder to your gearbox then HM. 9) Every HM Plus is fully adjustable for ignition kill time, so you can control exactly how you use the gearbox and how you want the quickshifter to work. 10) The HM Plus is transportable, meaning it can be used on many different machines with the correct wiring loom and shift rod length. The HM Plus is not tied to any ECU "box", so you can reuse your investment over and over! 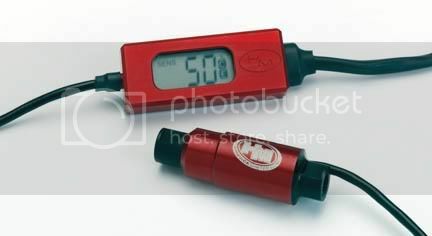 Multiple bikes, changing bikes during the season or buying a new one means you can most likely bring your HM Quickshifter with you for very little added expense. 11) HM Plus wiring looms are "plug in and go". No need to splice or cut in any way, no complications with other ECU's. Straight bolt on application, and clean removal if the time or need ever comes. It is fairly obvious that HM has brought to the market a vastly improved design which combines technology that demands customers consider when choosing a Quickshifter. And this is just a basic outline of the design differences and features of the HM Quickshifter, we are sure there are many other questions we have not addressed. So please let us know if you have any questions and we will be happy to assist you. Sorry this read was a bit long, but it takes a bit to get the comparative information out there to you! Last edited by Steve Larson; 11-27-2009 at 10:54 AM. No, actually a quickshifter is better money spent then 90% of the "bolt on" performance stuff out there! Just going along, no matter what the rpm's, shifting is ultra smooth, clean and efforless. Hammering the throttle; shifts are instant, positive and occur almost as fast as you can click the lever. Even a decent rider is still wasting probably over 2 seconds with the clutch movement every time they go thru the gearbox. Ever wanted to know what a paddle shifter would feel like on your bike? Leaned over and driving through a corner, you need to upshift. But when you pull in the clutch lever the entire machine "unloads", upsetting everything about the line you have chosen. Front end loads up, tires change grip, suspension swings forward and 'pushes" on the front end. Release the clutch and now the front unloads, back loads up, suspension swings again. Your line is changed, nothing about the attitude of the bike stays constant, and the corner becomes a mess. Most people just try and ride out the gear choice, or jam a gear like a dirtbike and accept the gearbox abuse and damage. Want a better solution? A solution that works every time, every corner, anytime, place or situation you need it? Install the HM and just click the lever. Quickshifters mean you can just "click" the lever and in milliseconds, with almost NO change to the attitude of any aspect of your bike, you have the next gear. How about double riding during "track days" (sorry, insurance companies don't allow anything aftermarket to be legal for street use anymore!). ANY modern bike can now make a shift without "bouncing" your passengers head off yours, or tossing them off the back if they are not paying attention. A QS shift is SOOO smooth and instant that the bike barely has any forward or backwards movement like you get when pulling in and releasing the clutch lever. Your passenger will thank you day in and day out! Not to mention resolving the problem of trying to ride steady lines through corners where clutch movement causes your passenger to flop back and forth with every shift and upset everything about your line choice! This alone is something that justifies the HM; all day long, through your entire ride, the machine 1000 times more enjoyable to ride! If anyone doubts where the world of shifting is going, just take a look at the new Honda VFR-1200. Can you imagine; perfect, instant upshifts. Every time, all the time, with NONE of the problems to machine attitude changes which come from using a clutch...? The HM Quickshifter uses the MotoGP technology to get you as close to this as possible, all in a tight, complete and cost effective kit. Compare this to an $800 exhaust slip-on that does nothing but "make noise" (and there is nothing wrong with slip-ons, no flame wars needed! ), but does a slip-on knock almost 2 seconds off EVERY run through the gearbox or pass down the dragstrip? Well designed and highly technical quickshifters like the HM add much more to your bike then just being "racer" stuff. The HM adds to the skill and percise action of your machine every moment you are riding, whether straight up, leaned over, hammering... or not. Every aspect of a performance bike involves shifting, and nothing is smoother, nicer to your gearbox or cleaner then the strain guage based HM Quickshifter. Good news! We are getting lots of emails asking the "deeper" design and operation questions, which means you are all starting to look into the performance of different products. Perfect for us, as the HM is technically the best performing product available! "Is there an option to set the independent kill times for each gear?" Perfect question, because it seems that people are making this feature seem as though it is a "bonus" or "special" capability. Our feeling is that this feature is there BECAUSE of the shortcomings of the older technology designs. The design of the HM (strain gauge based) is such that this is a moot point to our world. Please remember that the HM allows you to adjust any amount of shift sensitivity, which virtually all others (switch based) shifters do not. "With a "switch" type shifter, kill times are critical. This is because the lever must move a bit to close the switch contacts. This may or may not coincide with the correct position/load of the selector drum. This make timing critical as the switch type cuts the ignition and then the lever is moved by the riders foot to turn the selector drum. The amount of preload on the selector drum can be too much (damage) or virtually zero, you have no way to control this. This is also an issue as the switch ages and has to endure vibration, dirt, mud, heat, cold, rain and everything else real world riding throws at us. These "variances" over time can sometimes become bigger problems, and are probably resonsible for why so many people lose faith in using quickshifters. With a strain gauge shifter (HM) kill time is required (obviously), but the actual timing is very non fussy, and the differences between the gears is reduced to being virtually nothing. The reason for this (and this is why this type of shifter is so good), is that with a strain gauge shifter the selector drum is preloaded by a certain amount (determined by sensitivity) and a precise amount that YOU have setup for the exact and specific application. So when the ignition is cut, the change is instant due to preloading you have created for your machine. As a matter of fact, the sensitivity has more of a bearing on shift time than kill time. This is because the LOWER the sensitivity the more the selector drum is preloaded. The more preload, the faster the shift (and smoother even though it feels stiffer to the rider!). To further highlight the point, ALL of the teams in the Moto2 class, most of the WSB class etc etc use our shifters with a single kill time for all gears (they are our standard off the shelf products). Some have the option to set different times though their ECU, but choose not to! That pretty much says it all...?" Hope this gives you information you were looking for, if you have any questions we will be happy to discuss them with you. Had to post this as we do get to "toot our horn" just a little every once in awhile! ...says they are lapping faster then the Superbikes even on a cold track! Of the current 36 machines in Moto2 class, 34 of them are running HM Quickshifters, with the last team testing now. That is over 90% of the teams, where speed and reliability means everything, where they can choose to run ANYTHING they want, 90% are running HM Quickshifters! ...and we did not give one single shifter away, or pay a single dime to any of them! These teams PAID for each and every one. Plus, these are off our shelf units that are the exact same design and features anyone here can purchase. Which means that in the end, you CAN have the stuff of the best riders in the world on your bike...! Guess we can almost say that outside of the "spec" motors and tires the teams HAVE to run, HM Quickshifters are so good they are almost a "spec" item themselves! Our newest shipment is about to arrive, and for any of you currency traders out there, you probably know that the US Dollar vs. the British Pound has moved a lot in the past few months. So, Spring Season is here, time to get the bikes ready, and now you have even more more reason to step up NOW and buy your HM Quickshifter while the prices are LOW...! Let us know if you have any questions, happy to assist you! "...just a quick note to let you know that we have not had a single problem with the shifters this season. It's the first time we have not experienced a failure, and it's the first time we have been using HM ! The gearboxes are in great shape after two completed 24-hour races. The gearboxes used in practice are also in perfect condition. Many thanks to you, Jean Louis and Gregorio for supporting us and providing us with such high-quality equipment. PS : We have created a "HM" photo gallery on www.gmt.fr under the "photo" menu. I think it should be pointed out here the particular comment "It's the FIRST TIME we have not experienced a failure..."
This is one of the harshest uses of a motorcycle, for extended periods of time, and ZERO failure rate. Not only flawless, but GMT then adds "... the gearboxes are in PERFECT condition...". I think it should be noted that in talking to them they have NEVER gone (2) 24 Hour events and tore open a "perfect gearbox". There was always damage, and always parts that needed to be replaced. "PERFECT" after 2 races with the HM...! We think a pattern is forming here! HM Quickshifters are in a whole different league compared to every competitors product out there.